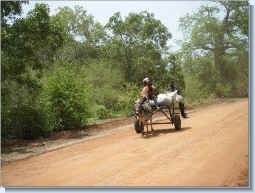 Despite being called the Gambia Horse and Donkey Trust, we care just as much about people as we do their animals. The Gambia is a very poor country and many people living there are living in extreme poverty. The majority of animal welfare problems that we see are a result of a lack of education and understanding, rather than outright cruelty. The people rely on their animals for their own survival so it makes sense for them to do everything they can to keep their animals healthy. Whilst we do provide veterinary treatments for animals in need, we also provide training for local people so that they can support their own communities with professional skills. We have provided training opportunities for farriers, harness makers, para-vets, livestock assistants and blacksmiths, enabling them to provide essential services to their local community whilst also earning an income for themselves. But our commitment to the local community stretches even further than this and the GHDT has assisted with numerous other projects to improve life for the local community. 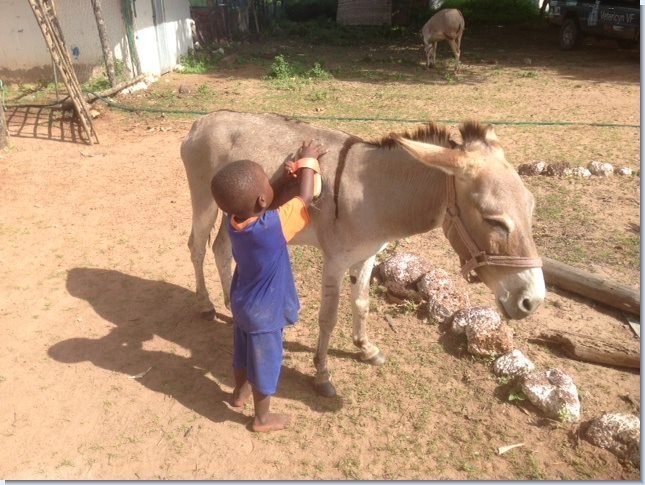 The GHDT have provided 147 donkeys to needy families who were unable to afford to purchase their own donkey. The donkey recipients attend an intensive training course at the GHDT centre where they are educated about how to appropriately care for and handle a donkey. 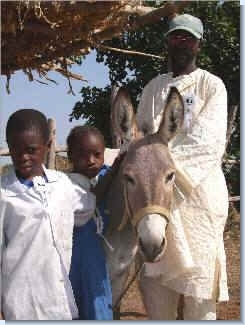 The recipient must provide a house for the donkey to shelter in before their donkey is allocated to them. The donkeys are provided on loan to the families in need, and the project manager travels to visit all of the donkeys every month to ensure they are being properly taken care of, and to provide veterinary treatment if required. 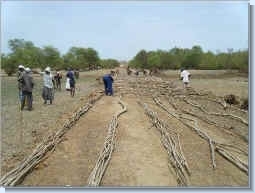 Calum's Road is a 7.5km stretch of road between the village where the GHDT centre is based and the riverside where there is a boat crossing to reach the local town, market, schools and hospitals. It is also the route to the local rice fields, and all the local people including women and children have to use this road on a daily basis. For many months of the year this road became totally water logged and was impassable for any vehicles. The local people still needed to use the road, so would be seen removing their clothes and carrying them on their heads to keep them dry, whilst they waded through deep water. Numerous injuries were caused to donkeys and horses pulling carts because it was impossible for their drivers to see whether there were any potholes beneath the water, and people would often delay hospital trips until it was too late for fear of making the treacherous journey. Before Stella Marsden sadly passed away she asked her sister Heather Armstrong to promise that she would raise the funds to rebuild the road, to make the route safer for both people and animals. Despite the enormity of the task Heather put a great deal of effort into honouring the promise that she made to Stella, and after much blood, sweat and tears the road was finally completed in 2010. Please visit our 'Calum's Road News Report' page for more information about the building of Calum's Road. To view more pictures showing Calum's Road please click here. 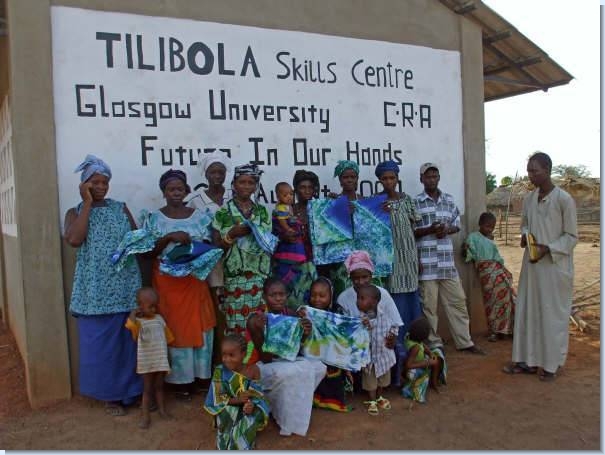 The Tilibola Skills Centre was built as a joint initiative between The Chimp Rehabilitation Centre, Future in our Hands (a Scandinavian Charity) and students of The University of Glasgow with the intention of teaching the village ladies new skills which will enable them to earn money. 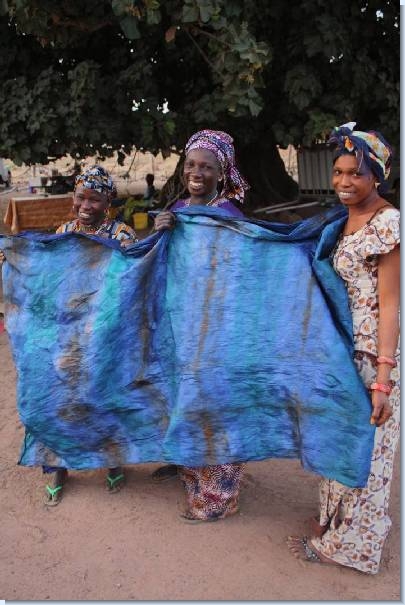 The ladies have been trained to make soap, bead necklaces and trinkets, tie dye and woven furniture. Tie Dye material made by the ladies of the The Tilibola Skills Centre. Sometimes when you are feeling rough, all you need is a little TLC. Some of the staff's children help us under close supervision. We believe that these children will grow up with a greater understanding and empathy of their charges needs.